Lucovitaal Melatonin prescriptions are currently not available via our online consultation service. You can, however, request an online consultation for sleep and insomnia. What is this nutritional supplement used for? Lucovitaal Melatonin helps with sleep problems and jetlag. Melatonin is a hormone that is produced in the pineal gland in the brain. When it gets dark, the excretion of melatonin increases so the body will go into a resting state. When this process is disrupted, sleep problems can occur. Lucovitaal Melatonin replaces the shortage of this hormone, which helps to maintain the natural day-night cycle and improve the quality of sleep. 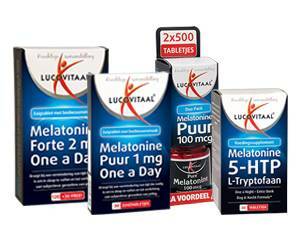 Lucovitaal Melatonin can be ordered online via one of Dokteronline.com’s partner pharmacies. Dokteronline.com’s partner pharmacies offer various treatments for sleep problems, including high-dose melatonin. Click here to see the full range of products. Insomnia is a very common health problem. It is especially common in older people because they produce less melatonin. However, other groups such as young children, menopausal women or people working night shifts can also suffer from sleep problems. Difficulty falling asleep can be very frustrating. Hours of tossing and turning will leave you feeling exhausted in the morning. Melatonin effectively relieves sleeping difficulties by aiding the body to reach a resting state more quickly. This shortens the time to fall asleep and ensures that you will wake up the next morning feeling rested. Lucovitaal Melatonin can also be used as a remedy for jetlag. Travelling to a different time zone can throw off your internal clock, making you feel sleepy or awake at inconvenient times. Melatonin helps the body adjust to the time difference, allowing you to get back into a normal waking and sleeping cycle. Lucovitaal Melatonin 0.1 mg (100 mcg): suitable for adults and children aged two years and above. Dosage: one tablet. Lucovitaal Melatonin 1 mg: convenient lozenges, only suitable for adults. Dosage: one lozenge. Melatonin tablets should be taken 30 minutes before bedtime. Read the package leaflet or instructions on the package before use. Lucovitaal Melatonin is generally well tolerated. If the effect is too strong, try taking a lower dose. If you suspect any side effects from Lucovitaal Melatonin, then consult a doctor. Do not use if you are allergic to any of the ingredients in Lucovitaal Melatonin (see the package leaflet or information on the package). This nutritional supplement is not suitable for use in pregnant or breastfeeding women. Lucovitaal Melatonin 1 mg or stronger is not recommended for people with a liver, kidney or autoimmune disease, and should not be used combination with certain medication (see the package leaflet for more information).